Ever since Flipkart’s epic U-turn on Airtel Zero rating, there’s a lot of noise on how telecom operators are adamant on bringing apocalypse in the country. Brouhaha over the issue has overshadowed the necessary and logical debate on the topic. And for a change, read what’s the point of view of the telecom operators. Considering sensitivity of the topic, before you read on here's a head-up – if you are an outrage police or firm believer of hashtag-criticize-anything-on-social-media, I'd suggest you to have a lot of patience as you scroll down. Contrary to the popular belief, also campaigned by so-called Internet activists, telecom operators also support ‘net neutrality’. Yes, you read that right. And, they are making efforts to resolve controversies surrounding the issue. But, they want their point of view to be heard and understood. Telecom operators body COAI yesterday held a lengthy press conference on the issue of net neutrality. In what perhaps been one of the lengthiest Q&A sessions at any press conference, telecom operators were asked all possible questions on the issue. Some really insightful questions were asked and some (mostly) really dumb ones – well, that’s kind of normal. One and foremost thing I concluded that most of the journalists were equally unaware about the issues related to the net neutrality, especially in the Indian context – and why that’s important? – journalists have to be well informed before they pass on the message to readers – perhaps this is why common masses haven’t understood the issue altogether. Now, let’s talk about telecom operators’ point of view. Telcos support Net Neutrality, but also seek a Net Equality. Confused? Well, in simpler words, telecom operators have sought a level-playing field with OTTs, reforming the existing regulations on voice, and most importantly data and voice customers to be treated equally. Also, they have sought a solution where they can continue to make investments (massive – around Rs. 500,000 crores over the next 10 years) for the telecommunications sector, considering the fact India still lags behind many countries in terms of Internet penetration and broadband quality. And perhaps you might not have been told as yet, telcos are also looking for a speedy solution. “Telcos are being vilified. Telecom companies have been champions of liberalization in the country. We support over the top players, contrary to what’s being portrayed. We don’t want future investments to be jeopardized,” commented one of the COAI members. 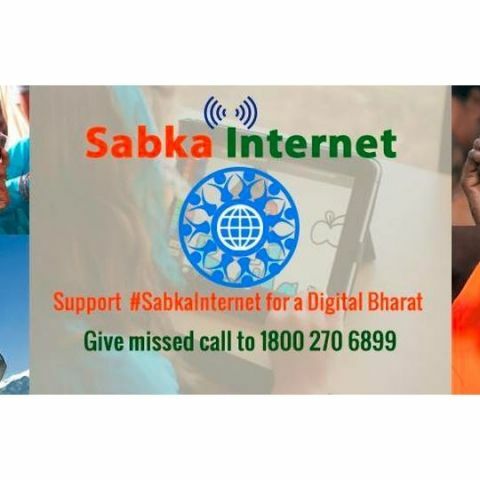 COAI has also introduced a new initiative called Sabka Internet and Sabka Vikas initiative – a platform that is supposed to help connect unconnected citizens. Website – www.sabkainternet.in – is already live. The industry body says the platform gives everyone (including voice customers across the country) equal opportunity to be heard on the issue, pointing out “poor shouldn’t subsidize rich”. COAI further pointed out majority isn’t on Internet, and shouldn’t be deprived of affordable Internet. “We believe that our role is to enable all services to reach customers across the country. One of the key factors is to enable this that same rules must apply to the same type of services, including mobile and IP voice services. This is the only way to ensure digital inclusion and bring about social and economic good to the common man,” says COAI while highlighting the necessity of level-playing field. Internet is flooded with half-baked articles, viral videos and opinions on the issue of net neutrality. It’s being discussed in the mainstream media including electronic and print as well. While most of you (not you outrage police) are still confused, try to understand that Net Neutrality is a crucial subject for the telecom industry and subscribers. Any move in haste will be counterproductive for the government, industry and more importantly you. Though, we hope the government comes up with a solution sooner. So, what's the deal with net neutrality?